QuintMas Sdn Bhd is today an acknowledged industry leader and key player in the country`s duty-free industry. The QuintMas Group of Companies, led by its principal company - QuintMas Sdn Bhd is a rapidly expanding stable of dynamic companies with its core focus involved in the duty-free business dealing in the wholesale and retail of branded wines, liquor, tobacco, cigarettes, perfumes, cologne, watches, apparels, souvenirs and a wide range of other top quality and popular products. QuintMas Sdn Bhd is today an acknowledged industry leader and key player in the country`s duty-free industry. The QuintMas Group of Companies has been able to build its success upon its decades of intimate industry knowledge, proven integrity and stringent commitment to providing only the best quality products and services to both visiting tourists and business travelers to the country who have the great opportunity to discover a truly new dimension in duty-free shopping! The Quintmas Group currently operates a state-of-the-art private bonded warehouse facility licensed by the Royal Malaysian Customs Department at Bukit Minyak. Penang supported by a growing logistics transport fleet. An in-house Royal Malaysian Customs & Exercise Department is also located within the warehouse premises to facilitate efficient and direct full compliance to required Customs regulations. The Group's bonded warehouse operations serve as a critical hub for the distribution of goods to its various outlets as well as designated locations in the region. 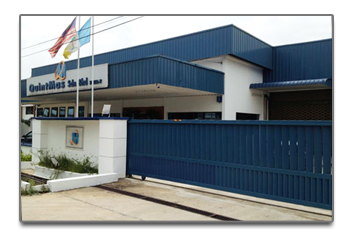 Quintmas Sdn Bhd was established in the year 2000 in Pulau Langkawi, Malaysia. Our main core business is based on wholesale and retail. Warisan Limpahan Sdn Bhd, a subsidiary of the QuintMas Group opens its new, exclusive 3 storey duty free shopping emporium at Padang Besar, Perlis. Star Five Duty Free Sdn Bhd, a subsidiary of the QuintMas Group opens its new retail outlet at Kayu Hitam, Kedah. The QuintMas Group ventures into the advertising industry with the set-up of QM Ads Gallery Sdn Bhd, a subsidiary advertising agency provide synergies for both internal and external organizational growth. The QuintMas Group under its flagship QuintMas Sdn Bhd officially moves into its new centralised Corporate Headquarters at Penang's prestigious corporate address, E-Gate in Gelugor. Quintmas (Langkawi) Sdn Bhd - a subsidiaries of the Quintmas Group opens its new wholesale and retail business office at Langkawi Mall in Pulau Langkawi, Kedah.